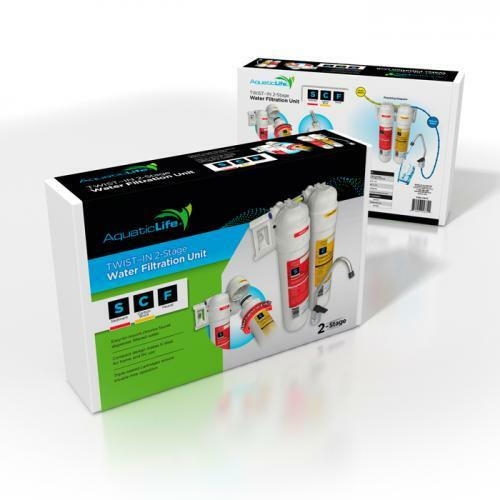 Brief Description: The Aquatic Life Twist-In 2-Stage Water Filtration system is a very compact water purification solution that efficiently combines improved filter media technology with our quick and easy to change twist-in replacement filter cartridges. 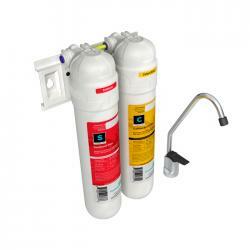 Notify me when "AquaticLife Twist-In 2-Stage Water Filtration System with Chrome Faucet" is re-stocked. The new twist-in media cartridge design makes filter changes simple, easy and clean – no tools required and no mess! The twist-in cartridges can be easily changed in only seconds with just a quarter turn and without contact with used filter material. This water filtration unit does not require a storage tank to make drinking water, normal household water pressure will produce filtered water, yet because the process of filtering water takes time it is common to use a storage tank to collect the filtered water, making larger amounts of filtered water available on demand. STORAGE TANK NOT INCLUDED. Assembled product dimensions: 6”L x 4”D x 13”H. Minimum water pressure: 30 PSI. 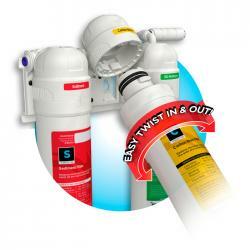 Suggested water pressure: 65 PSI • Maximum water pressure: 80 PSI - Optimal Water Temperature: 77°F (25°C).